SwitchMan is the desktop KVM (keyboard, video, and mouse) switch for anyone who wants to run two or more PCs at their desk. Just connect your PCs to SwitchMan and plug in your favorite keyboard, monitor, and mouse. Color-coded connectors make installation a snap! SwitchMan is the only KVM switch that combines advanced, professional-grade technology with a fun and easy-to-use design that fits naturally on your desk. SwitchMan includes the same bullet-proof design as Raritan's professional-grade products used in business-critical server environments worldwide. Raritan's unique emulation technology dedicates individual processors to each channel so every PC continuously sees its own keyboard and mouse. No matter how you use SwitchMan, you'll enjoy smooth, flawless booting, switching, and operation. SwitchMan is inexpensive, easy to connect and operate. 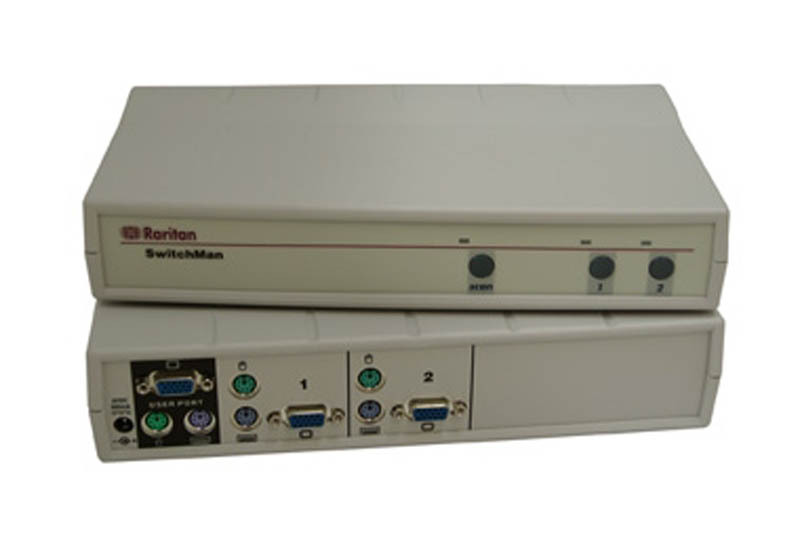 Connect your PS/2 and AT PCs to SwitchMan using male-to-male KVM cables, or use Raritan's premium, tangle-proof KVM cables for the highest quality video. Your standard PS/2 keyboard, PS/2 mouse, and VGA monitor plug right into the back. There is no software to load and no dip-switches to set. Just "plug and play!" Standard features like individual selection buttons with LED lights, hot-key, and AutoScan make operation simple and convenient. Raritan's SwitchMan is available in 2- and 4-channel models. Place the unit horizontally or vertically to save even more space on your desktop. Select PCs by touching individual channel buttons or by using simple hot-key commands through your keyboard.